Great news from the Office 365 Team: The very popular Content Search Web Part and the Cross-Site Collection Publishing capabilities will be rolled out to SharePoint Online within the next few days. What the heck is the Content Search Web Part (CSWP)? CSWP uses SharePoint enterprise search technology to display dynamic results on a page. What is heck is the Cross-Site Collection Publishing? The Cross-Site Collection Publishing feature enables you to create and manage content from one location, and publish across and to numerous sites without duplicating or replicating content-content stays in place as a single source of truth. In simple terms, The Content Search Web Part (CSWP) and Cross-Site Collection Publishing both enhance the number and quality of search-driven solutions you can build into your sites and portals. The workplace is changing. Today, over 70% of employees work outside the office. Across every organization, employees need easier access to the right information and insight on any device, anywhere to make fast, informed decisions. Yet over 40% of surveyed workers feel there isn’t enough collaboration in their workplaces. Progressive organizations are listening! Social in the enterprise is no longer a nice-to-have but rather a workplace necessity. On November 7, you and your customers are invited to join Microsoft for a live session with industry thought leaders and special guests to hear firsthand how Microsoft Office 365 has helped companies harness employee ideas, embrace new workplace cultures and technologies, and spark innovation and spontaneous collaboration in the workplace to accelerate business: getting it done, anywhere. And here is the third and final video in my WCM video series with Marwan Tarek. Today’s video is all about User Experience. You can watch it here. I’ve just published the second video in my WCM video series with Marwan Tarek. Today’s video is all about Content Publishing. You can watch it here. I’m so excited to announce that I’ll be representing AvePoint during GITEX Technology Week, taking place October 20-24 at the Dubai World Trade Center. 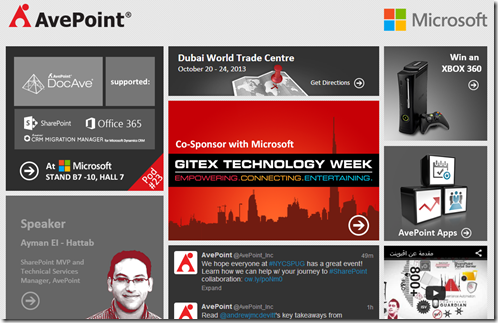 AvePoint will be located at pod 23 as part of the Microsoft booth (stand B7-10, hall 7). During the week, I’m planning to showcase AvePoint’s solutions for cloud and migration as well as its mobile apps for SharePoint productivity. Description: SharePoint is a very powerful technology platform of enterprise-level business services that has taken the world by storm. If SharePoint is that powerful, why are there so many failed deployments? Is it lack of training, governance, lack of business involvement, and lack of strategy, vision and talent? Yes and more! In this session we’ll dig into analyst studies and then explore solutions including a framework that will align to bring maturity to SharePoint deployments. We’ll explore practical solutions such as gathering real world business requirements and designing a SharePoint strategy & roadmap. We’ll also focus on how to align with business needs and discuss real world ways to address the doldrums of lackluster and failed SharePoint deployments. It’s really very exciting for AvePoint to be a part of GITEX Technology Week, since it’s widely considered to be the premier technology event in the MENASA region. It’s a fantastic opportunity for us to interact with our customers in the region and find out what is working for them, and what AvePoint can do to help them further collaborate with confidence. It’s my pleasure to announce our first offline session @ UAE SharePoint User Group. SharePoint 2013 (Whether on-premises or Online) provides a flexible platform and introduces the concept of SharePoint modern development. In addition to the conventional development methods, SharePoint 2013 introduces various APIs that allow for remote customization and development thus avoiding the need of local installations. The session will introduce different ways in which apps could be developed and how those apps could be packaged and published for others to use. Please register from here ..